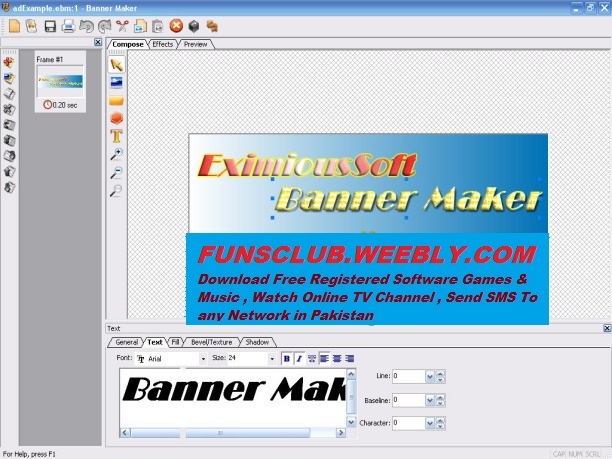 Banner_Maker_Pro_v7.0.3.rar (1.5 Mb) is the programm that is used to create any styles of banners you like. Banner Maker Pro 7, an easy-to-use Windows (2000, XP, Vista, 7) application that makes it simple to produce professional banners, buttons, logos, animated GIF ads, and web graphics. Unlike complicated graphics software that requires an artist's eye and a programmer's patience, Banner Maker Pro lets you become productive immediately, producing stunning graphics that can make any web site more impressive and effective. Banner Maker Pro's wizard-like interface makes it simple to create web graphics. Just follow the step-by-step image-making process. The program lets you make changes to your creations, save them, and upload them to your web site using the built-in FTP function. Start with your business logo, family picture, or choose from more than 500 backgrounds and images. Banner Maker Pro works with any Windows font, and creates crisp, clean, anti-aliased text. It's easy to combine your images and words into a banner of any size. The built-in image crunchers can transform bloated graphics into fast-loading images. The Power Preview feature lets you look at hundreds of combinations of backgrounds and fonts for your creations. You don't need to buy an additional program to create animated GIF images. Banner Maker Pro gives you one-click access to more than 60 different types of animations. Making animated buttons and banners takes only a few minutes, and the professional results will impress your web site visitors. Banner Maker Pro even generates the HTML, banner rotator, and mouse-over code for your web site. New features in version 7 includes 30 more animations, better looking text, a library of 240 professionally designed backgrounds, a built-in character map that lets you quickly add typographical and international symbols to your artwork, and Unicode support so all international alphabet fonts may be used.